Rovers midfielder John Oster will miss the next three months as he recovers from neck surgery. 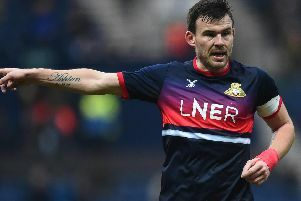 MIDFIELDER John Oster will be out for three months in the latest injury blow for Doncaster Rovers. The Wales international is currently recovering from neck surgery and is unlikely to return to training for at least ten weeks. Oster is due to see his surgeon again in two weeks for a follow up. Rovers have also confirmed defender Tommy Spurr will not return to training for three months. Spurr has had hip surgery and will undergo a hernia repair in two weeks. Martin Woods will take part in strengthening exercises over the next three months to determine if he needs another operation on his long term groin injury. Rachid Bouhenna still has his ankle in plaster and will meet with a specialist in two weeks. There was some good news to emerge from the Rovers treatment room. Paul Keegan will return to training next week following a small setback in his recovery from knee problems. And James Chambers should be back in full training in the New Year after good progress on his knee injury.